Last night Jags and I went to see David Carr read at Magers & Quinn and it was awesome. It was packed. People were sitting on the floor, standing in the stacks, and lined up out of the room. It was the kind of turnout that I wish every book reading had. It was made even awesomer by the fact that my much beloved Jim Walsh was conducting a Q & A with Carr. I’ll save the content of the reading for a post on Minnesota Reads later and instead tell you how I got to singlehandedly disappoint David Carr. After waiting roughly a fortnight (which we didn’t mind one bit because it gave Jags and I a chance to chat about all kinds of things including a really good discussion about Ethan Canin’s America America) Jags and I got to meet the author of The Night of the Gun. I have to take this time to tell you that if you are anywhere near where Carr is appearing, you should go. He was the kindest, most gracious author I’ve ever met. With each new person in line, he’d get up from the little author table, shake their hand, and introduce himself. As if he weren’t the reason we were all there. He personally thanked each of us for coming and buying his book, and for those of us at the end of the line (like me and Jags) he apologized for the wait. So kind, and so charming. When it was our turn. 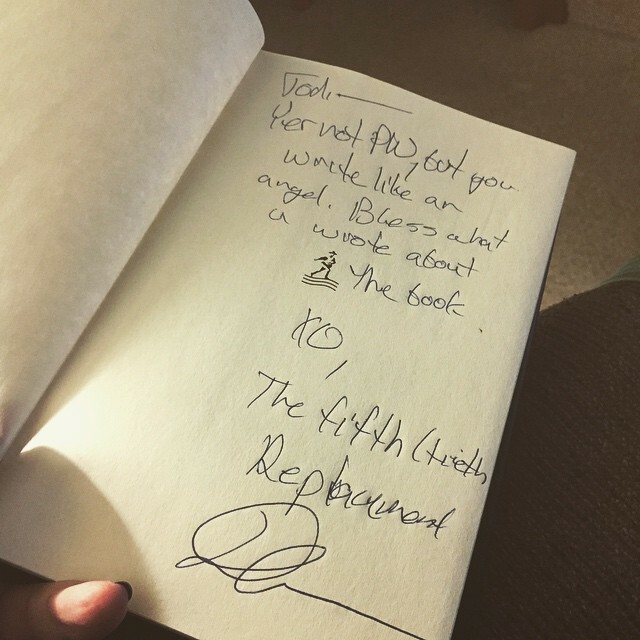 I told him how much I enjoyed the book and how I raved about it everyone I knew. I also told him that I was a huge Replacements fan and that’s why I was so eager to read it. Then he went on to tell us how excited he was about it, and how he was as excited about Paul Westerberg liking his book as much as some other person whose name I can’t remember. I felt so bad. SO BAD. Hi, I’m Jodi, got any dreams you want me to crush. I’m here for you. But, like I said, he was so kind and gracious. I was stunned by how friendly he was, and he wrote such thoughtful inscriptions. In Jags’ book he wrote about how muses and stuff (she often writes stories about addiction) and in my book he told me that even though I am not Paul Westerberg, I still write like an angel. Seriously, go see him read. Minnesotans, you have one more chance. He’ll be in St. Paul on Monday check the MN Reads calendar for more info.